I know that the more intricate make up takes time and effort, but I had a bit of a challenge on my hands. Quick mermaid make up in 20 minutes, and this is what I came up with. 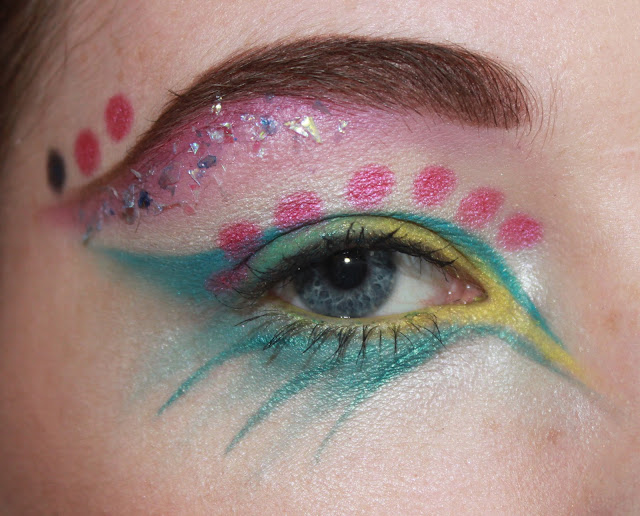 I mostly used the Collection 2000 Poptastic palette which I picked up at Poundland today - Would you believe it?! As I'm with my parents for my birthday I had little make up with me, and this palette was a savior. I'll do a swatch and review this week! I also used 3 colours from the Urban Decay Anniversay palette which can be substituted for other colours, and two colours from Mac, Crystal Avalanche and Charcoal Brown. Here's a step by step on how I create a quick look. First I applied primer, I used Urban Decay's Primer Potion. Then with my fingers I applied Crystal Avalanche, a shimmery white, all below my lower lashes. With a liner brush I used the middle blue from the Poptastic palette above, I sweeped it from a little further than the inner corner of my eye as you can see above and carried on above my crease and then into a flick under the end of my eyebrow. 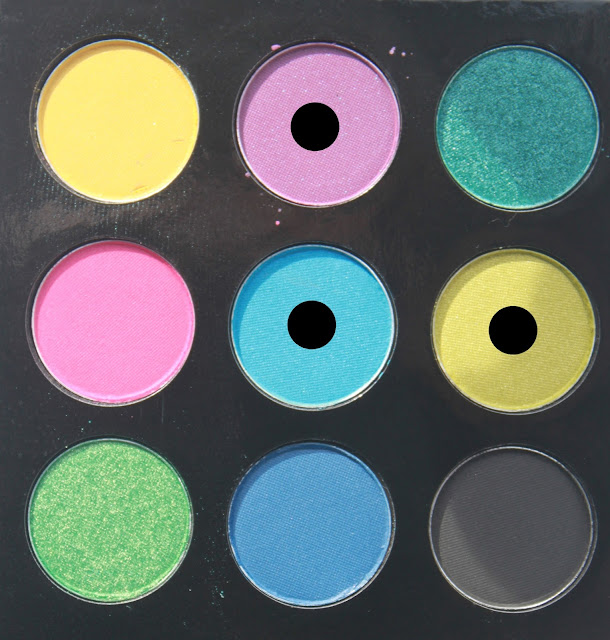 Then using the lime colour to the right of the middle blue on the Poptastic palette I followed with a liner brush below the blue line and carried on along the crease and then finished on the outer corner of my eye. I then came back to the point I'd made near my inner corner of my eye and then carried it on under my bottom lashes. 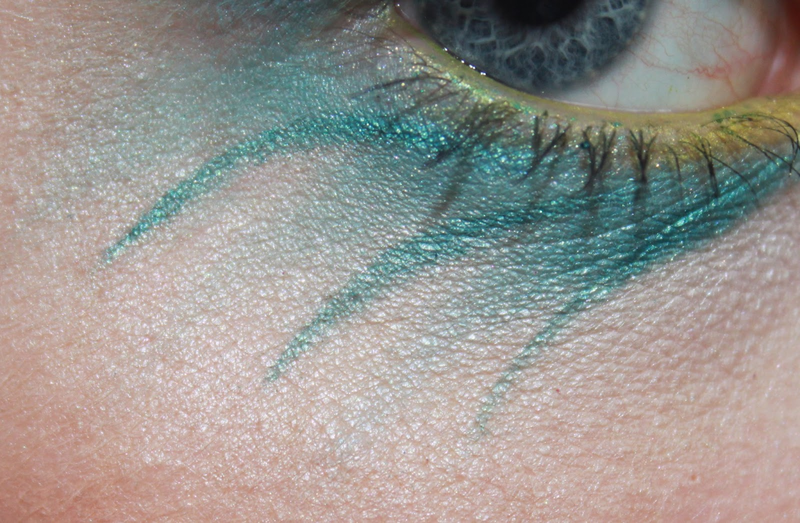 Back to the blue again, I filled in the gaps on my lids, blending with the lime. I then defined the flick towards the end of my eyebrow by thickening it, and fading it out. I then went to my bottom lashes and added 3 flicks downwards, but quite faint ones so they contrast with the teal thin lines I'd be making next. With a wet eyeliner brush I used Deep End from the Urban Decay Anniversay Palette I followed below the point I had made with the lime. With the thin eyeliner brush I then made a line before the faded flicks, and carried one another 2 times between the faded flicks. With another eyeliner brush I carried on my eyebows until they faded out, with Charcoal Brown by Mac. Below the eyebrow I used the purple in the Poptastic palette and blended it down. I then used Crystal Avalanche again below the purple and down towards the blue on the eyelids. I then added glitter over the top. With a cotton bud I used Junk Show to apply the dots. I applied them on my eyelids and above my eyebrows, but added one dot in Evidence. Then a coat of mascara. That's it! It took me just about 20 minutes to do both eyes. I wanted to share with you the final look and how many little products I used. It was quick and easy and ideal for what I wanted. I can't wait to hear what you think. I respond to all comments, and I can't wait to hear from you. This is really good for something so quick and using a collection 200 palette. I love the flicks, look like a water fall! This is amazing princess. Every new look gets better each time!